What do you know about Ukraine? Missed! The Klitschko brothers are no longer boxers, and Shevchenko hasn't played football since 2012. Now, the pride of the country is Ukrainian developers which are really big on technologies. For the latest years, Ukraine is objectively considered as one of the best outsourcing hubs for offshore and nearshore development. The fact is proved by multiple industry analyses, and the reason lays in the mix of the advantageous geographical location, highly talented IT manpower, and reasonable pricing. Let’s have a look at why you don’t have the choice except for Ukrainian IT specialists. 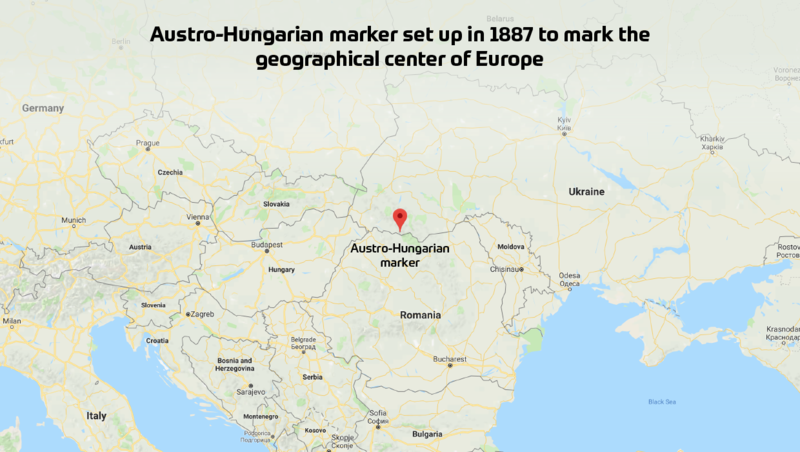 Ukraine literally lays just in the middle of Europe — we even have the special marking stone in one tiny Western Ukrainian village. To say honestly, we are one of the minimum five countries that believe to have that center belongs to them, but who cares. 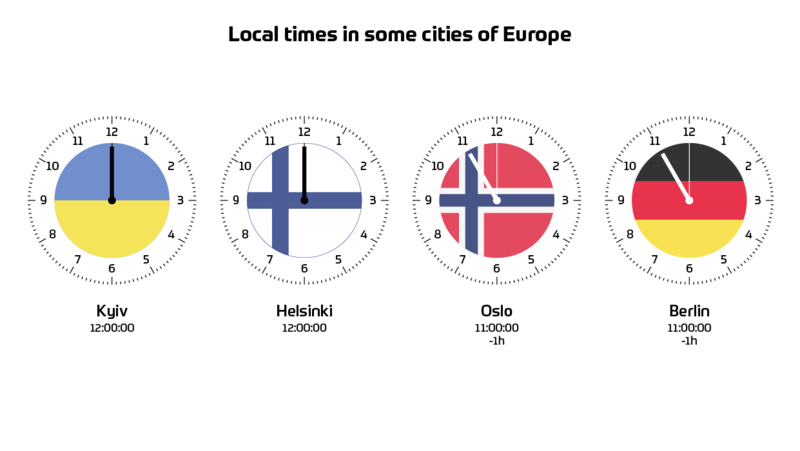 Owing to such a location Ukraine shares the same time zone with the nine Eastern European countries, while the time difference even with the farest Europe constitutes up to 2 hours only. Time zones match creates the convenient conditions for communication on projects, with no need to adjust the working schedule. Ukraine is also at arm’s length when it comes to offline meeting organization. A direct flight duration from the major European hubs to Kiev doesn’t exceed 4 hours, and that means no jet lags anymore. For the last three years, the most crucial issue for Ukrainians remains the military conflict in the two Western regions. This matter causes the most concerns of foreign investors, and it's quite fair. But it should be noted that the hostilities have been localized in 3% territory of the country. 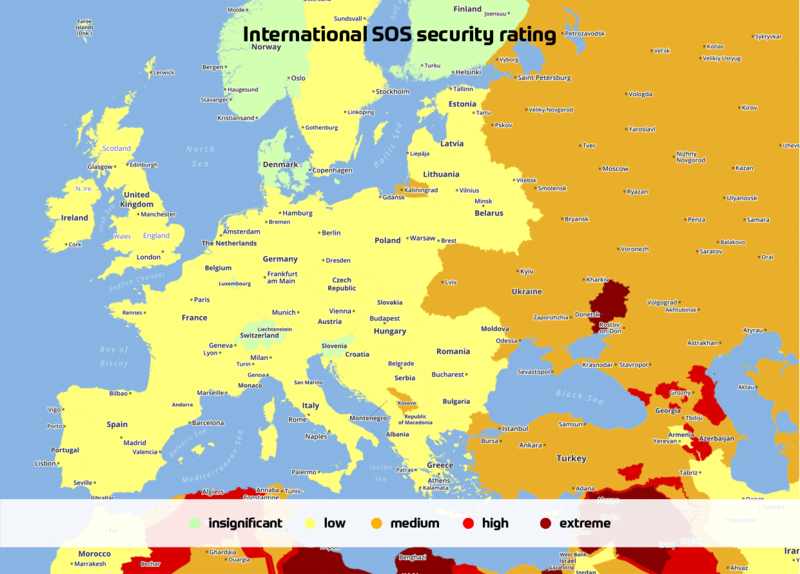 The rest of the territory demonstrates the peaceful situation and considered by the International SOS Agency as a moderate-risk place for visiting in 2018. The development hubs are located far from the instability zone and aren’t influenced. Owing to the powerful potential our IT sector keeps growing against all the political and economic instability. To give more confidence it’s worth to say that Ukrainian programmers are ready for relocation in case of emergency. At Amoniac, the movement can be organized easy enough since we have headquarters in Estonia. Ukraine has always gravitated toward European traditions and maintained diplomatic relations with European countries since the Kievan Rus period. At different times the territories of Ukraine were parts of the Lithuanian Principality, Polish-Lithuanian Commonwealth, and Austro-Hungarian. Thanks to that we have a similar mentality, culture, and communication manner. Software engineers from Ukraine are easy-going, honest and prejudice-free: they understand jokes and don’t blindly agree with all a customer says if it can hurt the product performance. The client is still always right in Ukraine but we have to suggest a better solution anyway. Since June 2017, Ukrainians can travel to the EU countries without visas, and that’s made us one step closer to Europe. And for nearshoring customers, it means lower cost and waiting time of offline meetings. 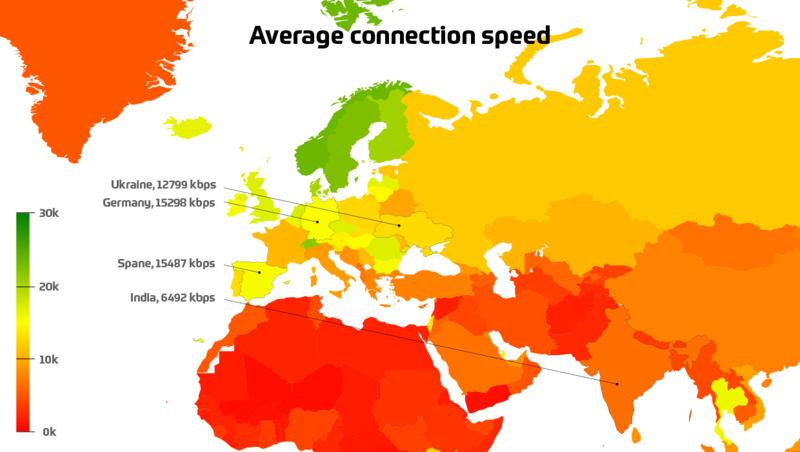 Ukraine has the affordable high-speed internet connection with overall coverage. In offices, the connection speed exceeds 100 Mbps. It means that you can hold real-time video meetings and interchange heavyweight data with the team, without damning the connection. Ukrainian IT industry is growing by leaps and bounds, providing great opportunity to hire extra-class tech professionals. In 2016, the number of employees occupied in IT sphere hit the 100K mark, which is 11% higher than in the previous year. 1K+ IT companies and 2K+ startups aggregate fully staffed teams for web and mobile development, so you can pass the whole life-cycle of the project on one company. So, where all those IT people get from? They simply graduated 4 hundreds of universities and colleges in Ukraine that annually produce 150K students. 10% of graduates are IT specialists. Apart from state institutes, privately held IT schools prepare IT staff ready to occupy junior positions. 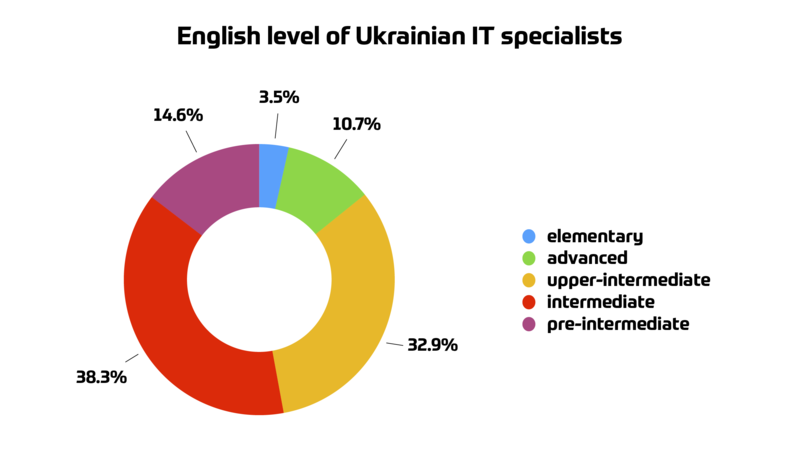 Ukrainian IT specialists are good English speakers — 82% of them know English at intermediate or higher level. Major IT schools hold English courses designed to improve language level of attendants and teach them IT vocabulary. Ukrainian engineers enjoy the work they do and everything about technologies. 79% of respondents among Ukrainian IT specialists chose their specialization because they are interested in technologies, not because it's well-paid. Though, the salary goes second, we’re only humans after all. Most developers know several programming languages and 65% are going to learn one more language next year. To stay tuned engineers attend and speak on local and international IT conferences, meetups, compete in startup battles and hackathons. 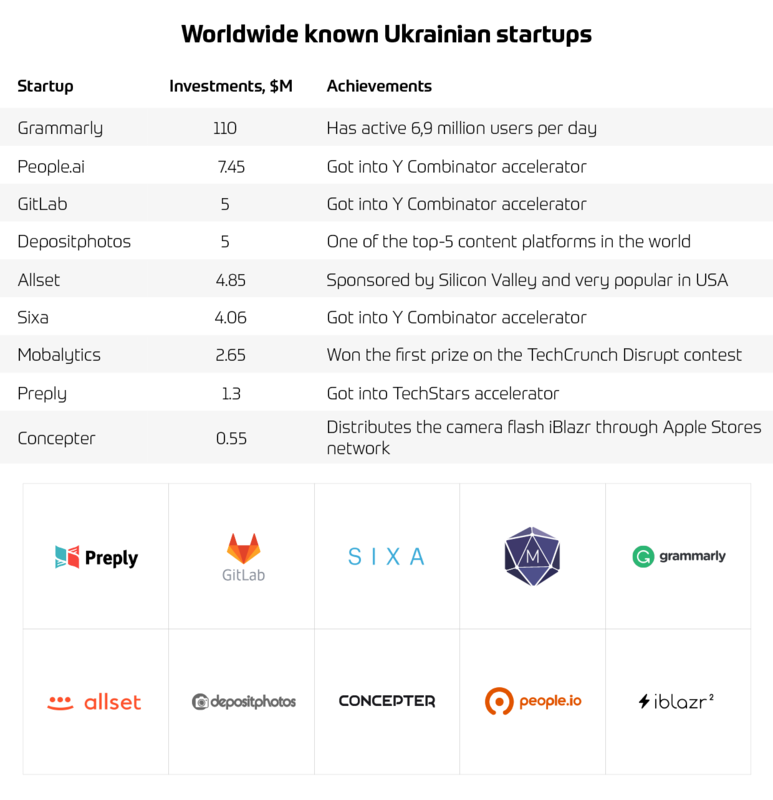 Apart from successful startups which are sponsored or purchased by world prominent IT players, Ukraine hosts more than 90 R&D centers of global technology companies. 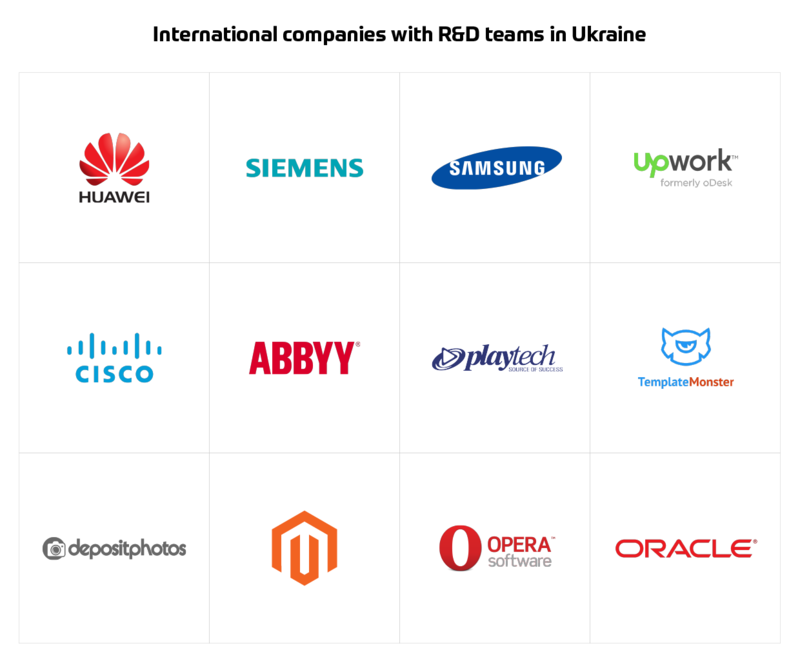 For instance, such companies like Cisco, Samsung, ABBYY, Oracle, Upwork, and many others entrusted their product development to offshore development centers from Ukraine. The world is crazy about Agile and so are we. For the first half of 2017, 26 events were already held on the agile methodologies: conferences, meetups, workshops, webinars. 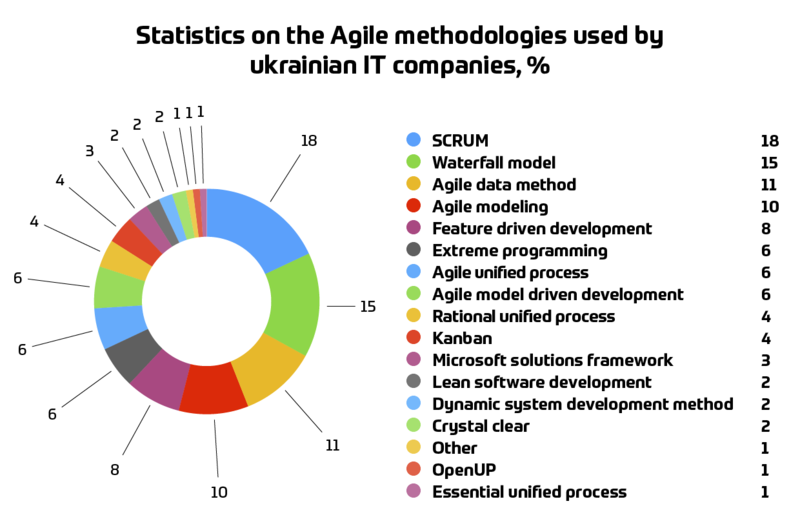 Ukrainian IT specialists are chasing after international scrum certification of ScrumAlliance, Scaled Agile, Inc., ICAgile international coaching agencies. Thanks to the knowledge and practical use of the agile methodologies, development teams from Ukraine deliver products that match volatile customers’ and environment's requirements. We’re sure you’ve fallen in love with Ukrainian developers already, but let’s talk about money. Firstly, by entrusting your product development to an outsourcing team, you are saving money already. To outsource development is cheaper than to maintain own development team. You bear lower tax burden and don’t deal with greedy trade unions. This means that you can easily replace the team if you are not satisfied with developers' performance. It’s not so easy to fire someone when he is under trade union’s protection, right? Add here the absence of social benefits and office expenses — and you’ll get the very lucrative deal. There are so many advantages of outsourcing development that we’ll dedicate them one of our next articles. The next step is choosing the outsourcing destination which can be onshore, nearshore, and offshore. And here it's crucial to strike the right balance between price and quality keeping in mind cultural differences. That’s why exactly Ukrainian programmers with their certainly competitive pricing will be the best offshore software development destination for US customers and the best nearshore destination for customers from Europe. If you’ve read this far, you have enough reasons to consider development teams from Ukraine as your next outsource team. 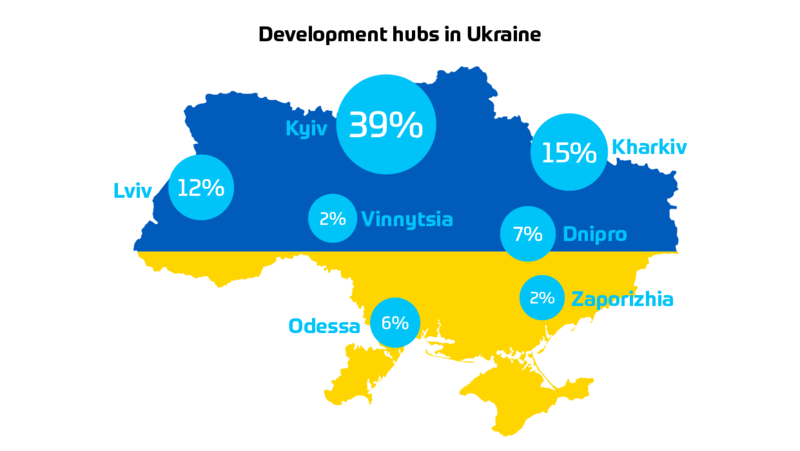 Strong technical and communication skills, saturated IT labor market, and beneficial location reinforced by competitive rates — all this makes Ukrainian R&D departments the perfectly reasonable choice for nearshore and offshore development. Now all that remains is convincing you to choose the exactly Amoniac team for your project.